After reading – and signing – this petition to Save The White Tipped Shark from Extinction, I was moved to write my two cents worth. As a Key West Charter captain I know how very blessed we are here with great fishing and particularly with great shark fishing. There are almost too many species to count of sharks in the world and I believe that the majority of them live in South Florida. All of the major shark species are well represented here and fishing for them is almost too easy at times. When anglers call and ask about shark fishing and our success rate, I give them an honest 80% on catching a shark on a full day of fishing. That’s a conservative estimate! I hate to give a 100% on anything when targeting one of a hundred species. If you don’t insist on a specific species, though, we do guarantee you will catch fish! Is it because the fishing is just so darn good in Key West? Or is it because we have an (arguably) good system of conservation enforced by both the State of Florida and the Federal Government? Say what you will about all the laws, seasons, emergency closures, etc., they are all (again arguably) in the best interest of the species. The White Tip Shark is what this petition targets and they are definitely in decline. I was fortunate enough to have spent last summer surveying very deep water (3,000 plus feet) and encountered them on a daily basis. My observations were exactly that, just observations and not based on any science only on common sense. Firstly, almost every White Tip Shark I saw had a monofilament leader hanging out of his mouth or the straight shank of a long line fishing hook in the corner of their mouth. Clearly an indication that they had sometime recently encountered mankind. They would make such close passes at any object in the water, a diver, an ROV, AUV, or even Zodiac inflatable boats, that if someone were so inclined, they could be hooked, shot or harassed easily. You must remember that White Tip Sharks are pelagic, in other words, they are always moving, and in deep water. How deep do they dive? No one knows. Because they are found in deep water and are always covering ground, they are hard to study and consequently very hard to research, i.e. : breeding habits, longevity, feeding habits, and just how deep they dive! White Tips, despite the fact they don’t get necessarily scary big or fat, are extremely aggressive. I always thought of them as the dog that chases you on your bike through the old neighborhood. They’ll keep up with you and nip at your heels but mostly don’t actually bite. I said mostly. Every diver, new or experienced that encounters a White Tip, regularly checked below them, behind them and focused their eyes long distance through the crystal blue water to see what may be coming from way far away. They love clear water and their eyes are built for identifying prey at great distances. That’s one of the features of White Tips: they move fast; very fast! Their long, thin bodies with narrow curved fins are definitely built for speed. White Tips are the species of shark mostly to blame for biting and eating shipwrecked survivors. 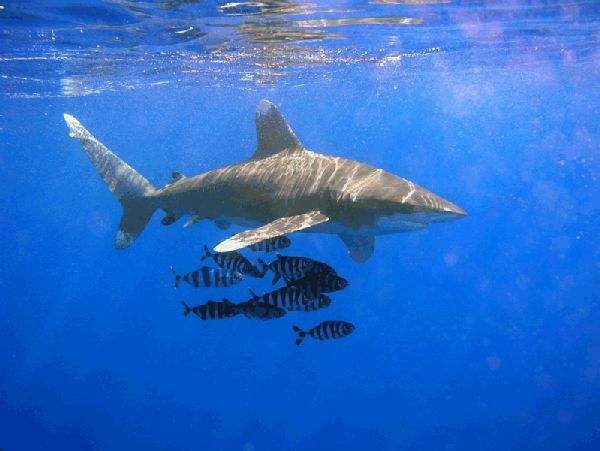 Not Bull Sharks, Hammerheads, or Great Whites, it is the fairly under-rated and unglamorous White Tip that is responsible for most attacks at sea in deep water. The White Tip is also most assuredly responsible for ridding the sea of any struggling by-catch, wounded flotsam, and sick or injured animals. In other words, they keep the ocean clean of dead or dying biology and that is indeed an invaluable service. If we could teach them to eat plastic and petroleum we would build monuments to them. My ultimate point is that if you are suspicious that there just isn’t a lot (or enough) research on this species, that’s because it is extremely hard to get. A free ranging predator that lives in very deep water and covers many miles a day presents a very challenging target. Don’t let this fool you. They are at the higher end of the food chain and at the rate we are losing our predators; we will be in a world of hurt if they are lost. But, please don’t just stop at the White Tip. All species of shark are in decline. As much as I hate to admit it, I personally have made a lot of money off of killing this entire species. And it wasn’t because I was such a wonderful guide or above average Captain. In fact, wenow release almost all of the sharks we catch. Don’t believe the hype, the movies, or the cliché references. Sharks are an easy target, and that has been their downfall. Please, PLEASE, don’t make this their epitaph. Do the right thing; sign the damn petition and feel better next time you are swimming in the ocean – if not safer the next time you are shipwrecked. Captain Craig Eubank operates the ABSOLUT (http://absolutfishingkeywest.com), a deep sea charter in Key West, Florida. When he’s not fishing, he plays guitar with local bands in the Southernmost City.